WARNING: you'll need to have ice cream easily accessible when reading this book; you will crave ice cream. I'm giving Susan Jane Gilman props on her first piece of fiction: it’s fantastic. The subjects are interesting (immigrants, rags-to-riches, ice cream! ), the writing is suburb, and the story is well told. It all fits together to create a page turner that fascinates and educates. I’ve learned plenty on this reading journey: the science behind ice cream, the story of an ice cream barge towed into the Pacific during WWII, the rumors of how ice cream causes polio, the business deal with McDonald's, and what makes Häagen-Dazs so delicious—and more. But, heed my earlier warning: you’ll need a scoop of that cold concoction next to you while reading Gilman’s description of flavors and offerings. Oh, and the tenement museum in New York should be thankful for all its soon-to-be new visitors as a result of this book. The quality of this story reminds me of a recent Pulitzer Prize winner: THE GOLDFINCH. The writing had me hooked, from start to the end of the 500th page. I loved how Gilman weaved in a story about a Jewish Russian immigrant that grew up in a Catholic Italian household during the early 1900s. I appreciate how Gilman extended the story into the periods leading to, during, and proceeding World War II. A bit is said for the mid-century, seventies, and pre-9/11, but the bulk of the contextual meat is set in the foundation stages of early 20th century. 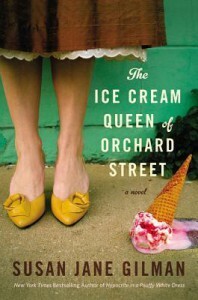 In the end, all that needs to be asked: A historical fiction book about ice cream? Yes, please! Thanks to Grand Central Publishing and the Hachette Book Group for sending me a galley to review. This is an excellent book and will make a terrific summer read.